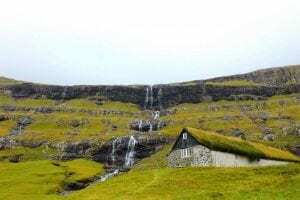 Ever wondered what life is like in the Faroe Islands? On the flight to the Faroe Islands, it dawns on me how little I know about the country. The picture in my mind is of an old-fashioned, rundown farming community. A place like Craggy Island from Father Ted. 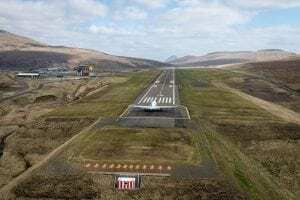 The islands’ only airport, Vagar, does little to change this perception. It reminds me of an old, forgotten Scottish outpost. Mainly because its duty-free shop is full of Tunnock’s teacakes. British soldiers, who occupied the islands during WW2, brought them here and they have since stood the test of taste. Confectioneries are not the only British stamp on the island. The airport itself built by British Royal Engineers. It sits in one of the most obscure places an airport could – surrounded by mountains on a piece of land barely long enough to fit a double-decker bus. “It was built there so the German warships couldn’t spot it from surrounding waters.” My taxi driver explains on our way to the hotel in Torshavn, the Faroe Islands’ capital city. Torshavn is surprisingly modern and its architecture beautiful. A combination of colourful wooden fishing huts, tall slick glass buildings and traditional stone grass-roofed houses, which blend gracefully into their surroundings. It looks like the town that Ikea built. Though the distinctive grass-roof is more than a quirky design feature. It dates back to when Vikings occupied the islands in the 9th century. The grass – nature’s insulation – protected them from the heavy wind and rain. Unlike us Brits, the Faroese embrace the elements and laugh about having 37 different names for fog. They are remarkable, inventive and death-defyingly resilient. They have to be. Mini-hurricane-like winds, not Santa Claus, visit the islands over Christmas. 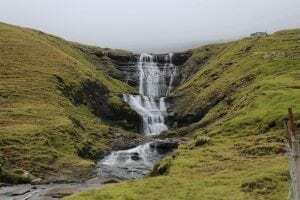 In parts of the Faroes, it rains for 300 days a year and the average temperature in Torshavn is 6.5 degrees, improving to a toasty 10.5 during summer months. Though winters don’t often drop below zero, due to the Gulf Stream, it’s still hard to understand why a group of Irish monks chose to settle here in 825. But settle they did. Until they were chased out by the Vikings, or so history would suggest. 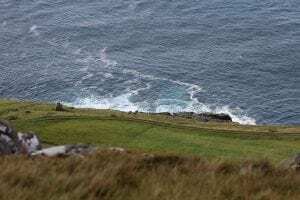 Yet remains found on the island of Sandoy recently have led some to believe that the islands may have been inhabited as far back as the year 300. The islands’, formed by volcanic rock some 30 million years ago, are a photographer’s ecstasy. Mountains stretch the length and width of the land. 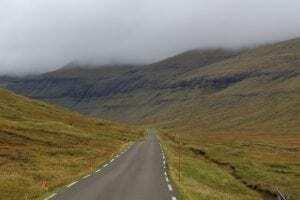 And at no point on the Faroe Islands are you more than three miles from the sea. Jagged cliffs fall sharply into the bubbling steel, blue seas below and fog tumbles down mountainsides and sweeps across the water like a mystifying spirit. The air here is so fresh every inhalation feels like a puff on a nebuliser. And the people are equally as refreshing. Welcoming, intelligent (some speak at least three languages), innovative and not adverse to tourism. When I spend the day with Oli and Anna Rubeksen, two local farmers, I learn more from their family and friends than I do looking through guide books. 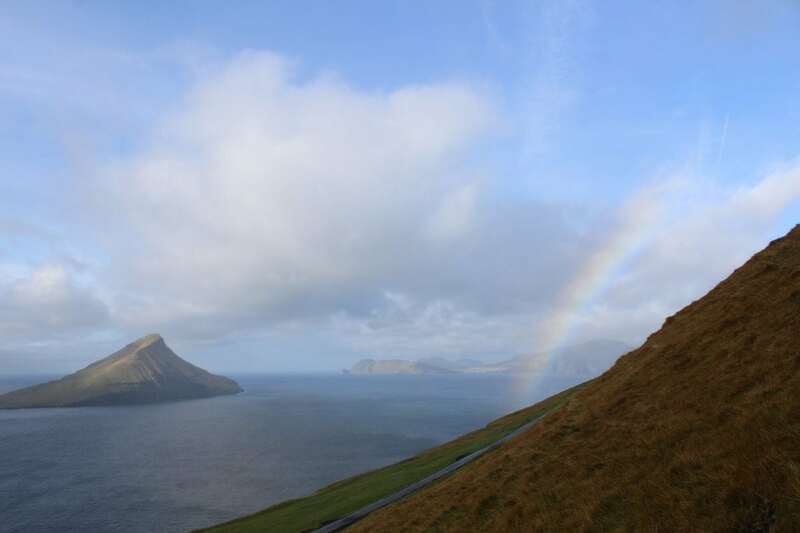 Faereyjar, as the Faroes was previously known, roughly translates to ‘the sheep islands’. Why? 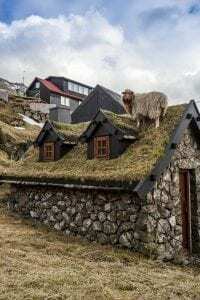 Perhaps because there are more sheep on the 18 archipelagos than people – you’ll even find them grazing on top of houses from time to time. 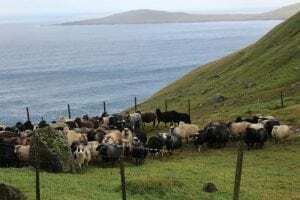 Intrigued by the islands’ connection with woolly mamals, I decide to spend my first full day herding them, an activity that only happens three times a year. On the morning of the herd, Oli and Anna invite me over for breakfast. Their house is located 15 minutes from the capital in the picturesque town of Velbastadur. Pristinely decorated with modernist furniture, antiquated trinkets, and well-placed fur rugs, it feels warm and cosy, like Christmas. Oli, a slim, intellectual, straight-talking man with a disarming smile, introduces me to his wife Anna, who is like the loveable aunty everyone has. Oli’s nephew, who sits next to me, looks like a viking. Tall, blonde and stocky with blushing red cheeks and a comforting grin. Intelligent and articulate, he quickly becomes my main source of information. 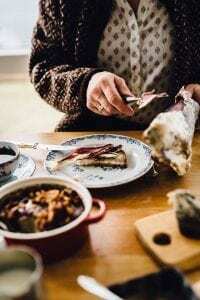 The family tuck into their breakfast of fresh salmon, cheese, breads, and Skerpikjøt (wind-dried mutton). Ræst (meaning fermentation) is the process of hanging meat (or fish) out in a shed to dry in the salty air. It usually takes around three months and is a big part of the Faroese diet. It is a traditional preservation method, previously a necessity during winter months when food was scarce. 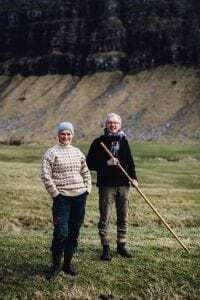 The Faroese are proud hunter-gatherers who thrive off the land. A family friend, a British-born Dane, invites me to try some fermented mutton. He cuts off a slice the size of a tic-tac. It looks like leathered jamón and tastes how you’d imagine rotten meat would. The potent, cheesy flavour slowly releases before hitting the back of my throat like a forced-down shot of tequila. I down my cup of tea then head to the farm where we’ll start to herd. 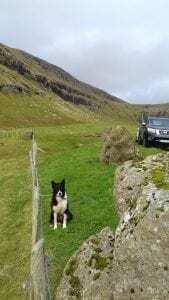 We are joined by a group of around 18 people – friends and family from neighbouring farms who all want pitch in – and two sheep dogs. One trained in English, the other Faroese. Oli taught them this way so they wouldn’t get confused when he shouts commands. What strikes me about the Faroese is how multi-skilled they are, and not in a jack of all trades; master of none, kind of way. Anna is a farmer, cook, and nurse. Oli a farmer, social worker, entrepreneur and maître d’. Even the national football team have side jobs. The next day a jolly taxi driver, funnily enough an insurance man by day, shows me around the islands. We go over the ‘old road’ which winds through mountains – unnervingly close to the edge – stopping at the occasional waterfall. There seems to be more waterfalls here than sunny days. We stop in Saksun, a picturesque valley covered in green-felt grass. A small scattering of traditional old white brick houses with thick, mossy rooves overlooks a stunning fjord. It looks like anywhere the Lake District only more striking and with less selfie stick yielding tourists. We visit the seaside town of Tjornuvik next and I convince myself it’s a location from the Game of Thrones – it isn’t. A few kilometres from the shore sit two prominent 70-metre-tall stony sea stacks, known as Risin and Kellingin. 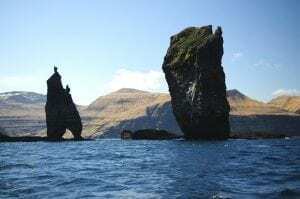 The story goes that The Giant and The Witch (two mythical creatures from Iceland) were so taken by the beauty of the Faroe Islands, that they tried to hurl them back to their native land under the cover of darkness. Only the sun came up early and turned them to stone. Everywhere you go here you’re told an equally enchanting story, which adds to the islands’ magic. On our way back to Torshavn, I ask Oli, the driver, about crime. He laughs. Crime here doesn’t really exist. Up until a few years ago, there had only been one murder in 23 years. “I think there are only 12 inmates in the prison.” He explains. “I knew a guy who tried to escape, but was found in a house close by.” He goes on to tell me that the chap broke out because he didn’t like people smoking indoors. The prison doesn’t have any serious offenders. Instead, they are shipped off to Copenhagen (the Faroe Islands is a self-governed country but is part of the Kingdom of Denmark). After what is an enlightening day driving around the islands – through tunnels blasted through mountainsides and over high roads similar only to the Scottish Highlands – Oli and Anna invite me to their house for heimablídni (a type of home hospitality that the couple offers to tourists) on my final night. The other guests and I are given a traditional welcome in the form of a shot of the potent local drink, aquavit. If you haven’t had it before, I probably wouldn’t rush down to Lidl to buy it. I’ve never drank petrol but can imagine it would have a similar taste. Smoky, salted mutton (dried in the couple’s laundry room) on dehydrated bread and a sweet rhubarb lemonade is the first course. Followed by Anna’s Roquefort-tasting, fermented fish soup. 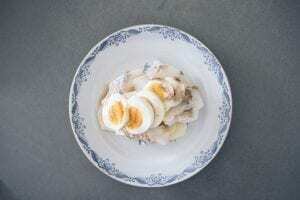 Then my favourite dish of the evening: eggs, cod, potatoes with a burnt butter. A simple but magical combination that takes you back in time. Traditional oven-baked Faroese lamb served with carrots and potatoes is for mains. The lamb is straight from the couple’s farm, which had been in Anna’s family for centuries before the couple took the reins in 1995. Each plate is paired with a locally brewed beer. The meal ends with a sweet, moreish rhubarb cake and cream. It’s the sort of desert you wake up the next day and wish you could order for breakfast. I can’t because, not only is it unsurprisingly not on the menu, but my time on the Faroe Islands is up. The picture I’d painted in my mind before arriving here, nothing but a warped past prejudice. 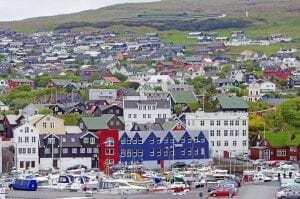 The Faroe Islands is a far cry from Craggy Island. 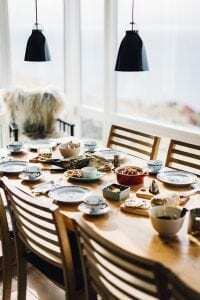 It’s more like the sort of place you long to visit, a mixture of everything you love about English culture with Swedish design and Socttish grit. And I am reminded of the British influence here once again before I leave. Before boarding my flight at the airport I speak with a local Faroese lady who tells me the thing she misses most (when she’s away from the islands) are Viscount biscuits.